A portly gent in the row ahead of me, trying to make smalltalk with a flag-distributing girl in that way men do when they’d really rather know how to flirt, asked her, “but what do we believe in?” before sniggering as he looked around vainly and optimistically for a neighbouring laugh. Similarly occupied with sporadic audience-seeking were young boys unfairly in the possession of vuvuzelas and people who had printed out poorly spelt banners. 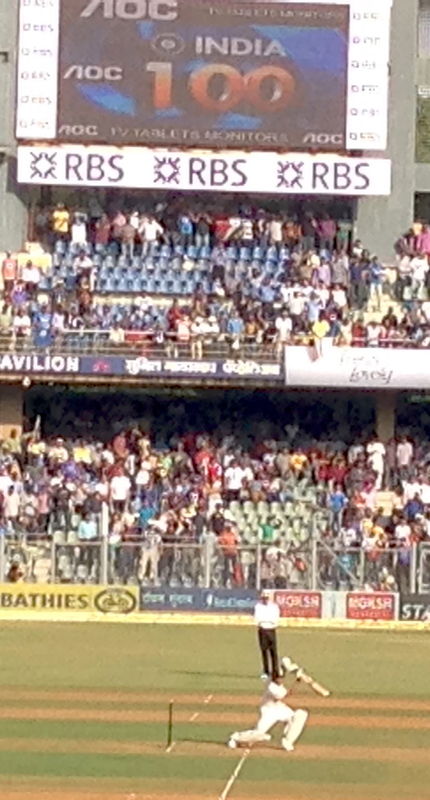 It was, then, a lazy morning at the Wankhede, largely because MS Dhoni had won the toss and elected to field. While this indeed gave the crowds a glimpse of Sachin throughout the morning — every time he stopped the ball the crowd sounded like it’d just climaxed — we’ve been raised as a batsman-celebrating nation, and despite Pragyan Ojha wrapping up the Windies with a five-for, the spectators cheered only and exclusively for that fellow playing his two hundredth, that guy who occasionally waved back when he was close enough to a fortunate (and suddenly louder) part of the outfield. It was electrifying, yes, but in a somewhat expected kind of way. As the afternoon shadows stretched across the field, with bad chicken pizzas sold by the bushel and water impossibly hard to come by, it felt like a pleasant but unspectacular rush, that of a crowd of well-meaning non-fanatics who wanted to yell out the local legend’s name and maybe trap him in their cameraphone sights. Things changed rather dramatically, when, after India began batting and motoring along rather beautifully, moustache-twirling young stud Shikhar Dhawan holed out. The crowd — which had been cheering West Indian lbw appeals with confounding vociferousness, as if a pair of Pakistani blaggards stood in the centre instead of two of our brightest — now lost it, and roared with approval. Damn the scoreboard, the wickets, the game, the nation. They wanted Batsman No 4 out there, and a couple of balls later, there he was. The rumble grew with every second as he strode out, swinging his weapon belligerently, as if he fancied a spot of casual slaughter to go with tea-time. And then began the glorious cacophony of support as the entire ground gasped and clamoured for him in mad, heady unison. With every ball he faced — or indeed, every ball even his partner Cheteshwar Pujara faced — the instinctive “Sa-Chin, Sa-Chinnn” yells got louder and more manic, and every spectator swayed in a sea of love and adrenaline. The momentum swallowed us whole, making it impossible not to join in, not to yell your lungs out, not to hope and fear and then exult as he leaned into that drive. For what it’s worth, he seemed to be enjoying it. The madness, the collective adulation, the indescribable hysteria. He looked around and played with exquisite fluency, his each poetic flourish making us achingly aware that we were seeing what we wouldn’t, ever again. He looked buoyed by the unconditionality of the attention rather than pressured by it, and we just stood and yelled and gaped. We celebrated his mother Rajni when the TV cameras swung in her direction right before the close of the day’s play, and hoped we sounded gratefully overwhelming enough to that lady watching her maiden Test Match. Hah. And here we were wondering what to believe in. Over and over and over again, SenSaab, you manage to hit the extremely high mark you’ve set for yourself but still manage to astound and elate us. It could’ve been said about Sachin but for me it is also about you. waiting for your reaction to Day 2..